It was Saturday evening, December 6, 1941. Most of the sailors at Naval Station Pearl Harbor were on liberty. The Bloch Recreation Center was filled to capacity for what was expected to be the first annual "Battle of Music." Three 21-piece bands had made it to the finals after several months of elimination concerts. Tonight would determine whether USS ARGONNE (AG 41), USS PENNSYLVANIA (BB 38), or USS TENNESSEE (BB 43) had the best band in the Navy's Pacific Fleet. Hank Lachenmayer, musician second class, readied his trombone as the PENNSYLVANIA band kicked off the program with a swing number, There'll Be Some Changes Made. After the specialty category, they played the sweet number, Georgia On My Mind. Their number for the jitterbug contest was a roof-raising version of Jingle Bells. The USS ARIZONA (BB 39) band entertained between competitive rounds and provided dance music later in the evening. Its members had recently graduated together from music school in Washington D.C. and were new arrivals in Hawaii. Hank recalls, "The ARIZONA band was great!" The four bands played song after song for the enthusiastic crowd. Several thousand sailors and their guests shouted and stood on chairs as they cheered the musicians. The competition closed with the PENNSYLVANIA's rendition of White Heat. USS PENNSYLVANIA was declared the winner and presented with the three-foot-high trophy. The evening ended with the audience singing God Bless America. As the band members packed their instruments, an ARIZONA sailor ribbed a PENNSYLVANIA buddy, "We get to sleep in tomorrow. You have to play for Colors at 0800." I met Hank Lachenmayer 53 years later. We both volunteer at the Navy Memorial and Heritage Center located on Pennsylvania Avenue in Washington D.C.
Hank retired from the Navy in 1960 and lives in Maryland. He told me the story of the band competition and a follow-on story of the trophy. In his words, "Subsequent to the disaster of the following morning, and upon hearing that the entire ARIZONA band had perished, there was unanimous agreement on the part of the Pennsy musicians that our prize should be awarded to our fallen comrades. It was named the USS ARIZONA Trophy, and never again placed in competition." The trophy was inscribed with the names of ARIZONA's bandsmen and donated to the U.S. Naval School of Music in their memory. It was displayed there as a hallmark and an inspiration for aspiring Armed Forces musicians. On the 45th anniversary of the attack on Pearl Harbor, Hank Lachenmayer and other members of the Pearl Harbor Survivors Association visited the Arizona Memorial. While touring the visitors' center and museum, Hank realized the trophy from the band competition on that long-ago evening should be part of the museum. He stared a lobbying effort in 1987 by writing a letter that stated, "With almost a half century now behind us, it is my conviction and the conviction of ex-Pennsy bandsmen whom I was able to contact that the trophy should return home, home to Pearl Harbor where the real victors are enshrined in the mighty USS ARIZONA!" 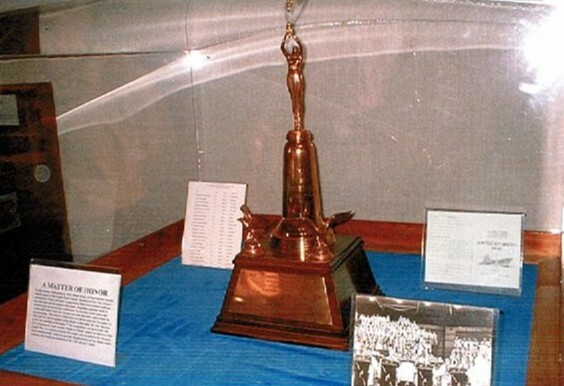 A lengthy correspondence followed, and the Navy officially transferred the trophy to the National park Service in 1988. After being examined and treated to ensure long-term preservation, the trophy was sent from Virginia to Hawaii. It was donated to the USS Arizona Memorial Museum in 1989, and now has a permanent home with the sailors whose memory it honors.